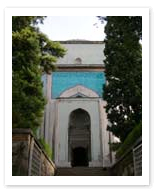 Built to contain the remains of Sultan Mehmet I, this turquoise-colored building is known for the stunning original tile work on its inside, painstakingly done by anonymous Ottoman artisans and craftsmen. Though Mehmet’s tomb is of course the largest you will see, the mausoleum also contains the tombs of Sultan Mehmet’s young children, touchingly and beautifully decorated with calligraphy and Koranic verse. The artwork is striking, as are the views from outside, which, upon stepping out into the world of the living, you can appreciate with a refreshing drink from one of the nearby cafés.